The aim of this MEWPs Instructor course is to provide learners with the knowledge, skills and attitude to train other in the safe operation of MEWPs. 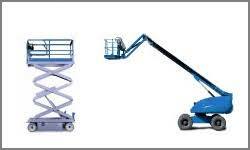 Operate MEWP equipment such as Spider Lifts & Vehicle Mounted. In successful completion of this course learners will receive a Qualtec MEWPs Instructor Certificate. Learners should have a good command of English both verbal and written. Experience. We are delivering instructor course for the last 15 years and have trained over 1,000 learners. Satisfaction. We get great feedback on this course. Check out the testimonials below. People come away feeling competent to deliver it. We provide a money back guarantee! If you are not satisfied after the first day we will refund the course fee!!! Price. We are competitively priced. There may be cheaper out there. However we offer value for money. Competence. All of our trainers are fully qualified to deliver this course. Progression. On completion of this QQI Level 6 Manual Handling Instructor course learners can progress onto the QQI Level 6 Patient Handling Instructor Course, PHECC FAR Instructor Course, PHECC CFR Instructor Course, Abrasive Wheels Instructor Course, Fire Safety and Fire Marshall Instructor Course, DSE/VDU Asssesor Course and the QQI Level 6 Training Delivery & Evaluation Course.